Henry Stapp is well known for his views on the nature of the mind and brain. A distinguished quantum physicist at Lawrence Berkeley National Laboratory, Stapp has been exploring these topics for over 50 years. "It is the absence from orthodox quantum theory of any description on the workings of process zero that constitutes the causal gap in contemporary orthodox physical theory. It is this 'latitude' offered by the quantum formalism, in connection with the freedom of experimentation, that blocks the causal closure of the physical." Stapp also adds a process 3 to represent the process that selects the probing action. Taken together, processes 0-3 represent the major components of how Stapp views the practical, empirical ontology of quantum theory. Stapp sees the brain as a quantum system at the lowest level of physiological brain function. He says we need to see the brain's nerve terminals and calcium ion channels as quantum in nature: because these foundational components are best understood in quantum terms the brain itself must be treated as a quantum system. "Whether or not the 'Yes' component is actualized is determined by 'nature' on the basis of a statistical law. So the effectiveness of the 'free choice' of this process 1 in achieving the desired end would generally be quite limited. The net effect of this 'free choice' would tend to be nullified by the randomness in nature's choice between 'Yes' and its negation 'No'." His own theory addresses this problem by drawing on the quantum Zeno effect. One feature of the dynamical rules of quantum theory allows for a stabilization of sorts regarding actions if a string of process 1 events can occur in rapid succession. Essentially if the initial process 1 request is selected by the outcome of the quantum event this action can be held in place by a rapid number of additional similar requests. Stapp believes that this rapid series of additional requests requires mental effort. Here he reaches back to find a kindred spirit in William James. Stapp reviews recent developments in neuropsychology that support his view. For example, he notes that empirical evidence seems to suggest that conscious effort is correlated with brain activity. According to quantum mechanics, the microscopic uncertainties must rationally be expected to produce macroscopic variations that need to be cut back by quantum reductions. Consistent with his Jamesian view of cognition, Stapp argues for the quantum brain as a "collection of classically conceived alternative possible states of the brain" all existing as parallel parts of "a potentiality for future additions to a stream of consciousness." Overall, this book is a rigorous and demanding reflection drawn from a lifetime of thought by one of the leading theoretical physicists of our day. A new model of the human mind and how it works "provides neuroscientists and psychologists with an alternative conceptual framework for describing neural processes that works better than behaviorist therapies based upon a robotic conception of human beings," says Henry Stapp, a theoretical physicist at Berkeley Lab. 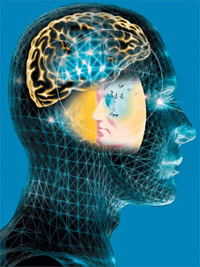 "The time has come for science to confront the serious implications of the fact that directed, willful mental activity can clearly and systematically alter brain function; that the exertion of willful effort generates a physical force that has the power to change how the brain works and even its physical structure," says Stapp's collaborator Jeffrey Schwartz. Stapp's investigations into the physics of consciousness arose from his efforts as a theoretical physicist to understand the quantum features of the physical world. "The most important innovation of quantum theory is the fact that it is formulated in terms of an interaction between the physically described world and conscious agents that are free to choose which aspect of nature they will probe." The physical activity inside the brain depends heavily on chemical and ionic processes. For example, the release of a neurotransmitter is controlled by the motions of calcium ions. The activity of these ions is accurately modeled by quantum mechanics. In Stapp's quantum model, the brain forms an expanding cloud-like structure in a high-dimensional state space. AR (2010) Stapp's views are challenging but I like them. I think there's something there, even if it takes us a century to work out the ideas in a practical form.